The highly affordable STM32 Nucleo boards allow anyone to try out new ideas and to quickly create prototypes with any STM32 MCU. 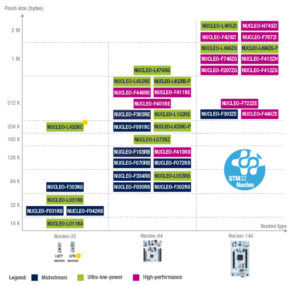 Sharing the same connectors, STM32 Nucleo boards can easily be extended with a large number of specialized application hardware add-ons (Nucleo-64 include Arduino Uno rev3 & ST morpho connectors, Nucleo-32 include Arduino Nano connectors). The STM32 Nucleo boards integrate an ST-LINK debugger/programmer, so there is no need for a separate probe. A comprehensive STM32 software HAL library together with various software examples are provided with the STM32 Nucleo boards, and seamlessly work with a wide range of development environments including IAR EWARM, Keil MDK-ARM, mbed and GCC/LLVM-based IDEs (ATOLLIC, AC6). 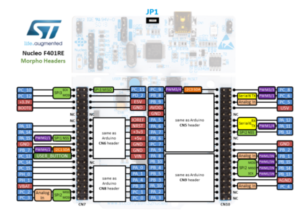 For use the NUCLEO-64 pin powered via USB connector using an USB charger is necessary install the JP1 on the NUCLEO board, see below.